if mobile arty isn't really possible, would it be good that, in some maps, especially push, when the attacking team capped a frontal flag, say, in Alam Halfa capturing 4 flags for axis, axis side would have a few unmovable "mobile" arty in the upper flags and could be used to barrage the allied position rather than using the british 25 pounders. They should be destroyable and respawn after a while rather than being repaired. i think this would make the game looked better, just a thought. And the StuG was able to use the spotting system in FH42 aswell, so why not now. the StuG was able to use the spotting system in FH42 aswell, so why not now. 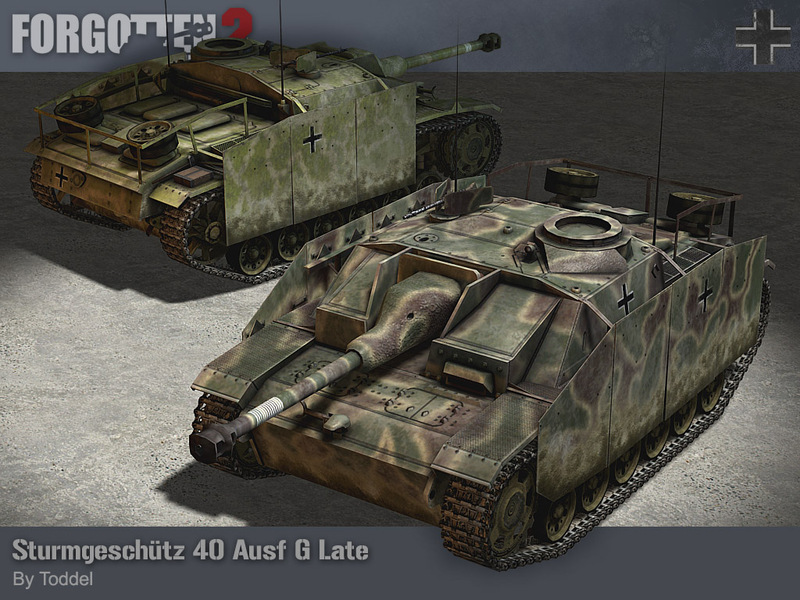 I hope the StuG.IIIG won't support artillery spotting in FH2, IRL it was totally unsuited to indirect fire, same for the StuG.IIIF and F/8, wouldn't mind the StuG.IIIA/B/C/D/E and StuH.42F/G being able to use artillery spots for indirect fire, if we eventually see these variants. As far as I know we have not yet found a way to make mobile artillery compatible with our artillery system. The gun has to be perfectly level in order for the HUD to be accurate. You may have noticed that when you place a mortar from a pickup kit on a slope it's sunk into the ground somewhat. As for the original suggestion; not a bad idea. We already have mortars spawning when you capture a certain flag and most of the time the heavy artillery can reach every point on the map. Or you add a HUD instrument like that thingie in Planes... dunno the word. That's not what he was suggesting. In FH1, if you got into a certain position on the StuG (I think it was position 3?) you could call out arty targets as if you were using binoculars. The StuG itself couldn't use them, but guys back in the base with Nebelwerfers and Mortars could use the spot. Actually, now that I think about it, the StuG could use the secondary fire to enter "Arty Mode," but it was rather useless because the StuG fired on such a flat trajectory. I think I only used it once to good effect. An enemy tank (I think T34) was across a flat field in some bushes. I knew he was there, but couldn't find his exact location due to the bushes. I fired a spot out of my number 3 position and saw (in the Arty mode) that he was actually behind the bushes a bit. I lined up the shot and took him out. Other than that unique circumstance, I don't think I've ever seen the StuG used for anything resembling indirect fire support in FH1. That would be a nice idea to try. Also, on Alam Halfa there are several pickup mortar kits for the Axis after they take the first line of defense. I suppose it might be possible to do something like have flat areas on the map for artillery, for then to have some visual cue in the HUD when you're nice and steady. I'm not a coder, so I don't know. To be frank, though, I don't really know if the artillery system is that necessary anyhow. I mean, sure, it's a good system, easy to use and everything, but surely it's not that important that we can't have artillery pieces if they can't utilize the system? I'd rather have a "stuka on foot" that fired rockets without the FH2 spotter system than to not have one at all. It really isn't harder than getting a forward observer to tell you where the shots are landing - you could even set up an Arty squad with the SL placing move markers where the shots impact, easily letting the person firing them know how he's aiming. And there's also the direct fire method - drive until you can see your target, then fire. Risky and not how it's supposed to be done, but still provides accurate fire. lol deployable mortar in big vehicle scale. it could be buggy though . It's not much different from getting out of the vehicle, spotting normally with binoculars, then hopping back into the vehicle (it's actually better to do it that way, because the "Arty Spot" position in the StuG couldn't zoom in like the binocs could). The only advantage you had was that you were a little more protected for the couple seconds it took you to spot (and IIRC, you could still be shot by infantry because the upper portion of your body was outside the StuG'sa cupola in that position). Hell, I suspect when we get the StuG in FH2, some of the positions on the vehicle (like the position where you are just sitting on the back or sides of the hull) will let you use your hand weapons, including binoculars if you have them. Just like it is now, if you choose certain positions on the tanks we have in game now. Also, both sides have "constant Arty Spotting Vehicles" in game right now, with the Recon Planes (granted, the Piper Cub apparently fires an Axis Spotting projectile, but I'm sure that will be fixed). It's just that no one uses them that way (just like no one used the StuG's spotting ability in FH1, either). Anyway, it's up to the Devs how they want to handle it when the time comes.